Well maintained 1 bedroom apartment with a private furnished patio area just a few steps away from the communal pool. The apartment itself offers an open plan living / dining area and full kitchen (should you wish to cook!) with all appliances you might need and crockery for four. The spacious lounge is air-conditioned and offers wifi, a large flat screen TV with English channels, DVD player, DVDs, Radio, CD player, Books, etc. You will also find an Iron and Ironing board, a hairdryer and straighteners for your convenience. A travel cot and high chair are also available upon request. The outside utility room offers a washing machine with drying rack. There is a supermarket just over the road from the complex and ample parking space should you need it. I came to the island 18 years ago and just fell in love with the place and the people, so much so that I have lived here ever since! We're lucky enough to enjoy beautiful weather throughout the year, making it the perfect place for sports; from diving and surfing to golf, hang gliding, mountain biking and exploring the island's walks... If you'd like any local information, advice on fine restaurants, or info on taking part in any of the islands activities, please don't hesitate to ask, I'm happy to point you in the right direction! My repeat guests call the apartment their home from home, you'll find everything you need for a relaxing holiday experience. You are just 600m away from the main strip with beach, bars and top quality restaurants. Modern, good sized bathroom with walk in shower, WC, sink and bidet. Wifi is available but guests are asked to refrain from downloading large files, movies etc. Modern newly decorated open plan living/dining area with breakfast bar. Includes comfortable sofa, large flat screen TV, DVD player with DVDs, English TV Programmes, Radio and CD player, selection of books. Welcome selection of Tea, coffee, sugar, milk, water, orange juice. Fully fitted kitchen offers electric hobs and full oven, fridge, microwave, kettle, toaster, variety of pots, pans and utensils, cutlery and crockery for 4 people. There is a popular 18 hole golf course just 5 minutes drive away. The accommodation has an English speaking contact who lives nearby, allowing questions or queries to be easily and quickly resolved. There is a supermarket across the road and restaurants within five minutes walk. The complex across the road also has a bar and restaurant and allows the general public to use them, with live music most nights. Outside: The patio is fully equipped with garden furniture including sun loungers and a parasol. The terrace enjoys the afternoon sun and is just a few steps from the communal pool and relaxation area. Utility Room: You will find a washing machine and drying rack with complimentary washing powder and conditioner, this is also useful for additional storage for bikes etc. Cleaning / Towels / Linen / Maid service: All bedlinen and towels are provided, including beach towels. Towels and bedlinen are changed weekly, with the weekly cleaning service. Fantastic property thru & thru like a home from home.Everything you could want & more from a beautiful apartment. The welcome pack was lovely with the added extras. Caroline is a fantastic host and I can thoroughly recommend this property. Thank you again for a wonderful holiday! Thanks very much, it was lovely to see you as always! Very relaxing holiday ideal location 5 mins from beach bars and restaurants. Everything you need for a self catering holiday .Nothing was to much trouble for Caroline the owner.Linen and towels changed weekly.Enjoyed so much first time ever have booked return visit. Thank you for your kind comments, looking forward to having you stay with us again next time! I'm so glad to hear that you had a good stay and I can only apologise for the noisy bin men! I will look into a double glazed window for the bedroom, that´s a good suggestion. We hope to have some news from the community soon regarding the swimming pool being repainted, as I'm sure you can imagine it takes time to do and will need to be closed during the refurbishment so we are trying to choose the quietest time when the least number of guests will be affected. Thanks so much for the feedback and I look forward to seeing you again in the future. What can I say? Was wonderful. Apartment had everything you needed. Very clean. Air con in front lounge. So many channels on t.v. super fan in bedroom. Constant hot water. Real home from home, even down to a tin opener, had everything we needed. Fully recommend. We will return. Only one down side. The pool could do with repairing (floor). Close to main drag, bars/shops everything. Very happy. Pleasent developement clean tidy and comfortable. Thank you for taking the time to review us, we look forward to welcoming you again in the future. 2nd holiday in this apartment. Great position for all bars, restaurants but out of the way for a good nights sleep, spotlessly clean & owner Caroline is friendly & always on hand if needed. Recommend & will return! Just ten minutes walk to the main beach, and fifteen minutes walk to Playa Chica, a well known snorkeling beach. For keen walkers there is a beautiful cliff top walk to the neighbouring Marina, Puerto Calero. The Airport is 15 minutes drive away. If you would like to explore this beautiful island with it's dramatic volcanic landscape, you will find it takes less than 1 hour to drive the full length of the Island with majestic panoramic views along the way. 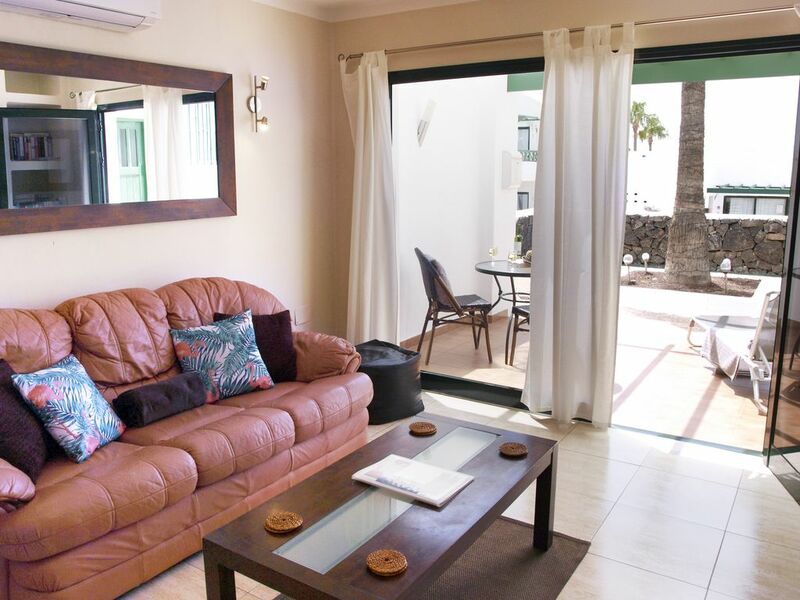 The apartment is just a short walk from the famous strip of Puerto del Carmen with miles of beaches, shops, bars, restaurants, with a fantastic nightlife. Whether you prefer a relaxing night in the Old Town harbour, an evening of live music or hitting the clubs, its all right there for you. Booking Notes A 50% deposit is required to confirm your reservation. Changeover Day: Changeover day is flexible and we try our best to accommodate early arrivals and late departures. Please contact us for more info.